There are three different residential densities namely Residential 1 (Low), Residential 2 (Medium) and Residential 3 (High). The zoning for Offices is known as Business 4 that inter alia includes Medical suites, estate agents and veterinarian clinics. 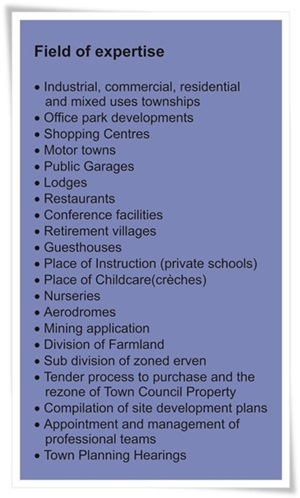 Special zoning is usually acquired through township establishment, rezoning or council consent if a combination of compatible land uses is required or to define a certain land use which does not resolve under the abovementioned. The zoning for industrial can be categorized into two categories: namely Industrial 1 (Heavy Industries) and Industrial 2 (Light Industries).